Jahmal Cole, the founder of civic education nonprofit My Block, My Hood, My City. Cole spoke about his experiences and the work of his nonprofit at a Wednesday event organized by Northwestern Community Development Corps. 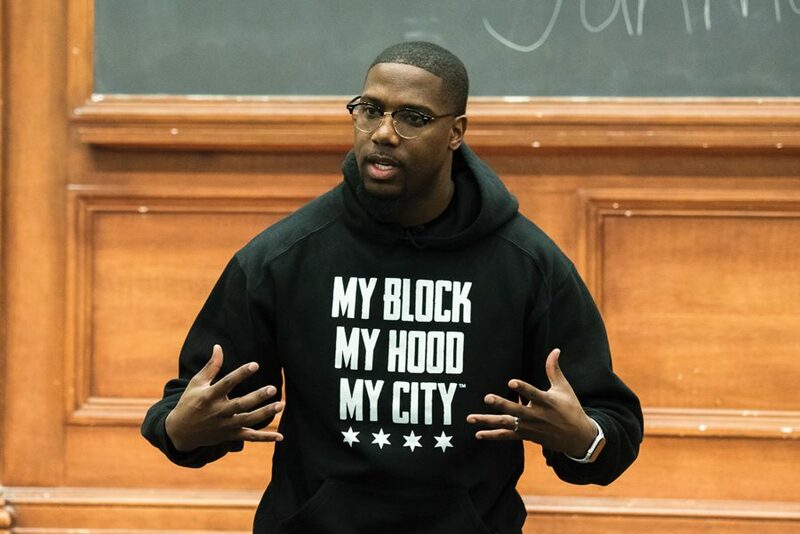 Northwestern students should leave Evanston and broaden their perspectives on Chicago communities, Jahmal Cole, the founder of the civic education nonprofit My Block, My Hood, My City said at a Wednesday event. His organization provides students with the chance to travel across Chicago and other locations — both national and global — to broaden their worldview and inspire their later successes. Cole said youth in these neighborhoods need to be exposed to new experiences to change their psychological outlook on life. My Block, My Hood, My City is also expanding beyond the school system: Cole said his organization has begun engaging in advocacy for community cleanup and interconnectedness throughout Chicago. Weinberg junior Noah Spector, the dialogues co-chair for NCDC, said the group decided to reach out to Cole because his work corresponds with NCDC’s mission of connecting different Northwestern, Evanston and Chicago communities. After graduating high school, Cole said he enrolled in Wayne State College, where his basketball coach taught him that there were no excuses for not succeeding. He said he used this philosophy to guide his volunteer work as a mentor to inmates at Cook County Juvenile Temporary Detention Center. Cole said by using his own experiences as an example, he was able to show inmates they could be successful later in life. While volunteering at the center, Cole was inspired to create My Block, My Hood, My City. Cole said students at NU should talk to underprivileged students to show them that there is a way to further their education and later become successful. “If you can make it here, whatever disciplines you have, I would love for you guys to step outside of your comfort zone and just talk to those people,” Cole said. SESP sophomore Gabbie Cooper, a special events co-chair for NCDC, said Cole’s message resonated with her. She said she feels like sometimes NU students forget how isolated they are from surrounding communities, both in Evanston and Chicago.